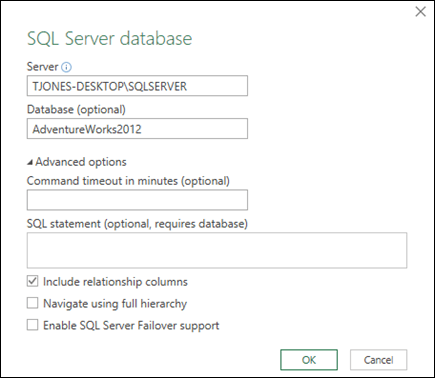 Use Excel's Get & Transform (Power Query) experience to connect to a SQL Server database. 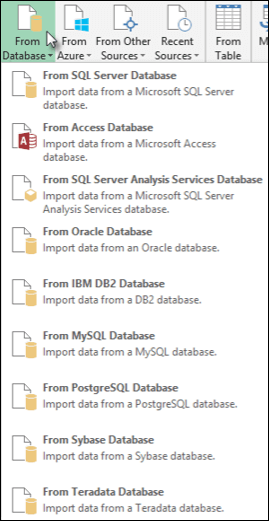 Click on the Data tab, then Get Data > From Database > From SQL Server Database. If you don't see the Get Data button, click New Query > From Database > From SQL Server Database. In the Microsoft SQL Database dialog box, specify the SQL Server to connect to in the Server Name box. Optionally, you can specify a Database Name as well. If you want to import data using a native database query, specify your query in the SQL Statement box. For more information, see Import Data from Database using Native Database Query. Select the authentication mode to connect to the SQL Server database. Windows: This is the default selection. Select this if you want to connect using Windows authentication. Database: Select this if you want to connect using SQL Server authentication. After you select this, specify a user name and password to connect to your SQL Server instance. 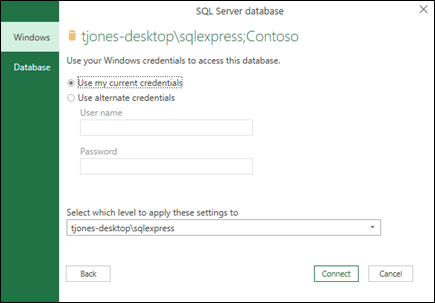 By default, the Encrypt connection check box is selected to signify that Power Query connects to your database using an encrypted connection. If you do not want to connect using an encrypted connection, clear this check box, and then click Connect. If a connection to your SQL Server is not established using an encrypted connection, Power Query prompts you to connect using an unencrypted connection. Click OK in the message to connect using an unencrypted connection. You can also use the Query Editor to write formulas for Power Query. In the Power Query ribbon tab, click From Database > From SQL Server Database. The Get & Transform experience was not available in Excel 2007, so you can use an Office Data Connection (.odc) file to connect to a Microsoft SQL Server database from an Excel 2007 workbook. SQL Server is a full-featured, relational database program that is designed for enterprise-wide data solutions that require optimum performance, availability, scalability, and security. The Data Connection Wizard starts. This wizard has three pages. In step 1, type the name of the SQL Server computer in the Server name box. Use strong passwords that combine uppercase and lowercase letters, numbers, and symbols. Weak passwords don't mix these elements. Strong password: Y6dh!et5. Weak password: house1. Passwords should be 8 or more characters in length. A pass phrase that uses 14 or more characters is better. Alternatively, you can clear the Connect to a specific table check box, so that other users who use this connection file will be prompted for the list of tables and views. To ensure that the connection file is always used when the data is updated, click the Always attempt to use this file to refresh this data check box. This check box ensures that updates to the connection file will always be used by all workbooks that use that connection file. SSO Select this option to use Single Sign On (SSO), and then enter the appropriate identification string in the SSO ID box. A site administrator can configure a Windows SharePoint Services site to use a Single Sign On database in which a user name and password can be stored. This method can be the most efficient when many users are connected to the server. Note: The authentication setting is used only by Excel Services, and not by Excel. The Import Data dialog box is displayed.